A season-high, 2,690 fans packed Western Financial Place on Friday night and were treated to an action-packed 3-2 Kootenay Ice overtime victory over the Saskatoon Blades. Hosting their annual ‘Pink the Rink’ night, the game brought in school kids from all over Cranbrook, proudly decked out in pink to show their support for anti-bullying. In addition to the team supporting anti-bullying initiatives through the event, the players gave back to the city with one of their best efforts of the year. 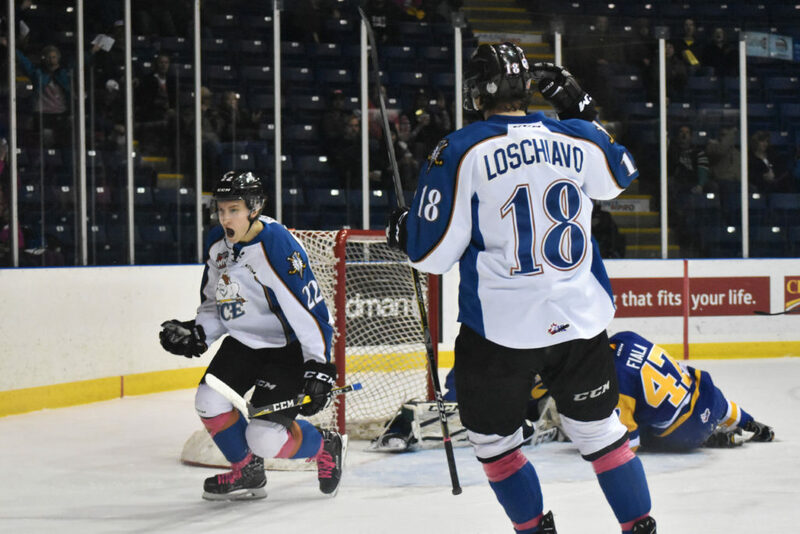 While Loschiavo wasn’t completely sold on the idea of the team continuing to wear pink tape and skate laces every game, he thought it was a fun promotion. Despite the eventual win, the Ice didn’t get off to a great start on Friday and were trailing the Blades after only 15 seconds. Markson Bechtold tapped in a pass from Jesse Shynkaruk to beat Ice goalie Jakob Walter right off the bat and put an immediate damper on the raucous crowd. The Ice didn’t quit though. They amped up their physical play and were rewarded when Brett Davis jammed a puck in tight past Blades netminder Logan Flodell to even the score. In the second period, despite three power plays and an abundance of chances for the home Kootenay squad, the game stayed deadlocked at 1-1. Although Mason McCarty gave the Blades a lead with a goal five minutes into the third period, beating Walter high on a rush, the Ice once again kept their composure. With less than six minutes to go in the game, Keenan Taphorn found Noah Philp and beat Flodell for a huge tying goal. The game was Philp’s first since sustaining an upper-body injury in Kootenay’s last win on January 27. According to Pierce, his return was a big factor in the team’s success. “It helped our depth, especially down the middle,” he said on Philp’s return. “We’ve been going a lot of nights with a couple of 17-year-olds and a 16-year-old playing the middle and [Philp], having that extra year of experience, it helps. With the game all knotted up, an overtime period was necessary. In 13 prior games decided in extra-time, Kootenay had just one OT win with eight OT losses, as well as two shootout wins and two shootout losses. With the strong backing of their crowd, the Ice added another positive tally to that total. After just over two minutes of fast end-to-end action, Vince Loschiavo ended the game with a great deke in close. Despite scoring the game-winner, Loschiavo credited the win to a great team performance. The game’s other hero, Philp, was also quick to praise his teammates. “It felt good [to be back] and I thought the boys had a lot of energy,” he said, at the end of the night. “Especially with Kroeker being sick on Wednesday and coming back too. He’s a big part of our lineup, so I thought the two of us coming back was a good spark. The Ice are back in action at home again on Saturday to take on the Victoria Royals. While Loschiavo believes that the key to success in the back-to-back situation is coming back with the same total team buy-in, his coach was happy to just let them celebrate their accomplishment for now. Overall, Pierce was happy with his team’s play and the crowd. “I thought it was gritty. [Saskatoon] is a pretty hard working team that plays the game the right way, “ he said. “It was an exciting hockey game, especially the finish [and] it’s fun to be in that environment. Puck drop for Saturday’s game is at 7 p.m.